Objective: The objective was to assess the dietary intake of subjects with irritable bowel syndrome (IBS) and to compare it to that of international recommendations. The hypothesising assumption of this study was that a situation in which subjects insist that diet or trigger foods play a part in symptom generation may lead to an unbalanced dietary intake. Design: This was a descriptive observational study, with an analytical component. 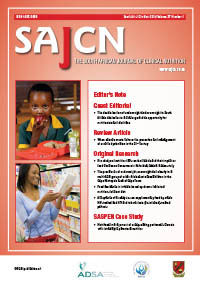 Setting: A private, secondary care-level clinic in South Africa. Subjects: The study population comprised 122 participants. Each subject completed an estimated, three-day dietary record. The data were analysed using a computerised food analysis programme. The fructose intake was analysed semi-quantitatively. IBS subjects’ protein and carbohydrate intake were significantly higher than the recommended dietary allowance for protein and carbohydrate (p-values < 0.000 and < 0.000, respectively). Outcome measures: The identification of dietary risk factors that affect IBS. Results: The IBS subjects’ daily total dietary fibre (15.13 g ± 13.11) was significantly lower (p-value < 0.000) than the dietary reference intake (DRI) target intake of 24.76 g/day, and the intake of micronutrients, calcium, iron and folate) was significantly less than the DRI. There was no significant difference in macronutrient intake between the diarrhoea-predominant IBS (D-IBS), constipation-predominant IBS (C-IBS) and the control groups. The total number of fructose serves per day was not statistically significant between the three groups (C-IBS 2.68 ± 1.68, D-IBS 2.15 ± 1.86, and controls 3.17 ± 2.39, p-value = 0.157). Conclusion: The IBS subjects in this study consumed diets that were deficient in key micronutrients and total fibre when judged against the recommended DRIs. Dietary adjustments may have been tailored by subjects to minimise symptom development and this led to nutritionally deficient diets.